We are looking for 1-2 Artists to add to our amazing team!! 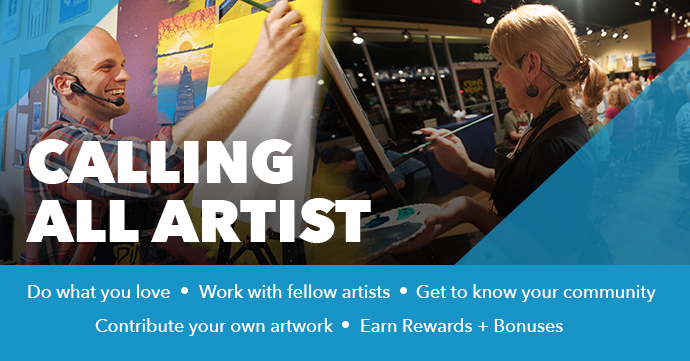 Pinot's Palette, a leader in the paint-and-sip industry, has an immediate need for some fun charismatic art instructors! If you have a talent and enjoy entertaining and guiding others in art, this is a job you. Customers will follow your instruction while they paint their own masterpieces. The ideal person for this job will have an outgoing personality, strong work ethic, eagerness to learn, positive attitude and the ability to work quickly and energetically with our team of artists. - Assisting customers and staff member(s) to ensure smooth class flow and promote customer painting success through teamwork and positive attitude. -Cleaning and up keep of the studio and supplies. - Must be able to have fun! Bring energy to a room! -Ability to design and execute quality, acrylic paintings in various painting styles. ***This is a part-time position with a probationary period. Please visit www.pinotspalette.com/jonesboro to find out more about us.